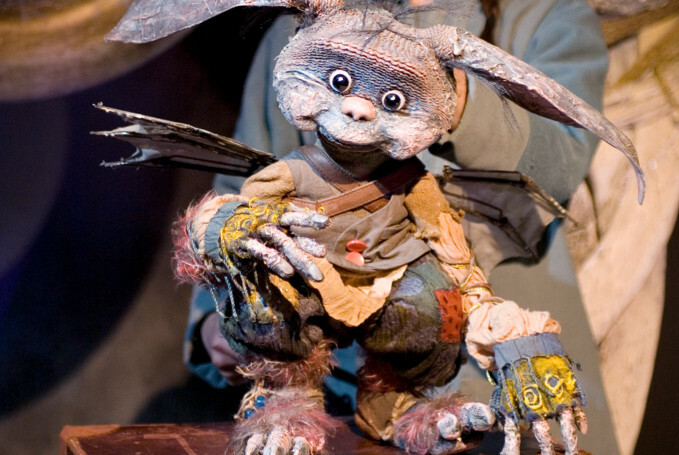 Skitterbang Island, a puppet opera for children, offers a glimpse into another world. Not just the world of Skitterbang, the curiosity-collecting monster. But a world where theatre for young audiences is given the patience, thought, resources and care it deserves. This production shows great potential for the future of children’s theatre, and in this sense, Skitterbang Island feels very special. Marie and Uncle Edvard are sailing (and singing), when a storm hits their ship and they are separated. Looking for her uncle, Marie follows the sound of his voice to a cave – the home of Skitterbang, a friendly creature that looks a little like a gremlin. Skitterbang looks after Marie, but her uncle, desperate in his search for her, is less accepting of the unusual creature. Though not the first opera for children, the creation of Skitterbang Island in 2010 was arguably a chancy adventure. Despite this, the production never feels like a risk – from the moment Marie (Natalie Raybould) and Uncle Edvard (Sani Muliaumaseali’i) start singing, it is naturally captivating. Martin Ward’s gentle compositions are complemented by the three distinctive voices of Marie, Uncle Edvard and Skitterbang (Lowri James). A variety of ingenious devices help to tell the story, and the set is exquisite – cozy and enchanting, Skitterbang Island is atmospheric in the extreme. The only criticism then, is that whilst pioneering, the production could be slightly too safe. The revival of Skitterbang demonstrates the production’s success – let’s hope this island is a leaping-off point for further boundary-breaking!